My latest discovery in beauty are pure silk pillow cases! I have teamed up with The Goodnight Co for an exclusive offer FOR YOU! More details are at the end of this post. Leading up to my wedding I have made one beauty rule, that I am sticking to no matter what: Getting my beauty sleep! I have made a commitment to myself to allow myself to get enough sleep, each and every night in the month leading up to the wedding, no matter how busy things are getting. My bedtime routine includes a meditation, calming herbal tea, soothing aromatherapy fragrance and sleeping in silk! I really need my sleep to function properly, have good energy levels and glowing healthy skin. I touched on the importance of beauty sleep previously here, if you are interested. There are many holistic rituals that can help you to help establish a healthy and good sleep routine. We all try to supercharge our beauty sleep by using night time serums & creams, but do you know about the latest anti aging sleep treatment? The pure silk pillow case! That's right! A smooth pillow case made from 100% natural silk will keep your skin wrinkle free, your hair untangled and simply feels amazing to sleep on. They are hypoallergenic and can really improve your skin when used nightly and kept clean. Silk can help ease sensitive, flakey, dry or itchy skin. It is a great solution for eczema sufferers or those with generally sensitive or irritated skin or other medical conditions. Silk contains a natural protein and essential amino acid, which makes it a far more natural and body-friendly material for bedding. The type of silk used is less absorbent, so that your beautiful creams stay on your skin and won't sink into your pillow instead. Your hair won't be as frizzy, knotty or static when sleeping on pure silk! Doesn't this sound great? I have treated myself to The Goodnight Co silk pillow case. Dave calls it my princess pillow case :) I have to say, it does feel very luxurious to sleep on silk. And a little word of warning upfront: I don't think it's easy to go revert back, after you have tried how good it feels. You might get hooked after the first sleep! They come in three colours. I own the white one (although I now really want the Charcoal one as well, to swop over when the white one is in the laundry) I love my new silk pillow case and waking up without creases across my face in the morning feels so good. I also think it's the most beautiful gift! Mine arrived in a pretty little gift box and I have a feeling I will be ordering some more for some lucky girlfriends. 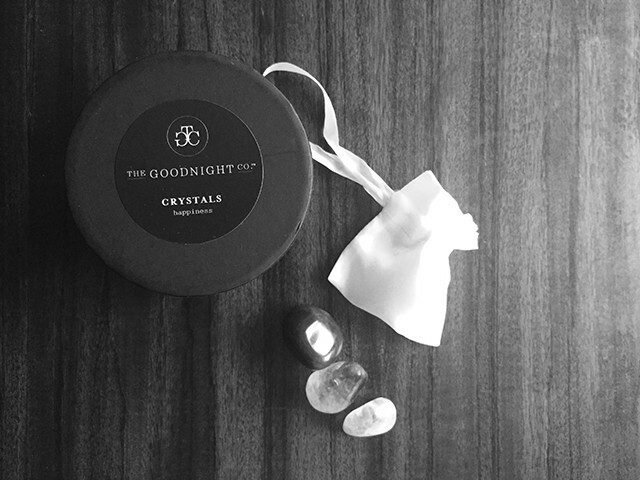 Check out The Good Night Co 's products, they sell a beautiful range of assorted crystals & gemstones, pure silk eye masks, as well as a toxin free & luxurious laundry liquid. The Goodnight Co is the brainchild of two Brisbane mums who wanted find a way to help people take better care of themselves as well as the other important people in their lives. Such a lovely idea. I am all about selfcare and think it is an essential ingredient leading to happiness and true beauty. To share the love I have teamed up with The Goodnight Co ladies for an exclusive offer: As a LIV Lundelius Blog reader you can get 15% off your purchase using the code Liv15.